meet you in person at the Junction, as he would gladly have done. The missing dispatch has not even yet come to hand, and we have inquired very fully, though have been unable to learn where the delinquency rests. The President suggests that you should be advised of this, in order that you may cause the failure to be traced, with a view more particularly to preventing future omissions in the same quarter, which may prove even more embarrassing than this. Baltimore, Nov. 22d, 1859—8 o'clock A. M.
Please advise me promptly when any troops leave Harper's Ferry, so that we may provide for their accommodation from Relay to Washington. I send package on mail train for Gov. Wise to your care. Harper's Ferry, Nov. 22d, 1859—8.52 A. M.
All is quiet here. Gov. 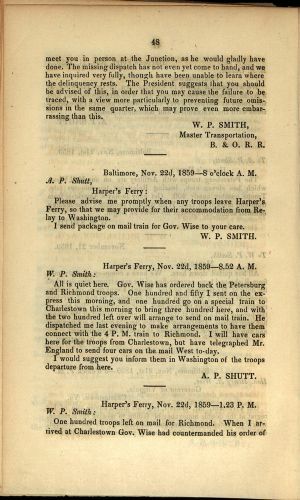 Wise has ordered back the Petersburg and Richmond troops. One hundred and fifty I sent on the express this morning, and one hundred go on a special train to Charlestown this morning to bring three hundred here, and with the two hundred left over will arrange to send on mail train. He dispatched me last evening to make arrangements to have them connect with the 4 P. M. train to Richmond. I will have cars here for the troops from Charlestown, but have telegraphed Mr. England to send four cars on the mail West to-day. I would suggest you inform them in Washington of the troops departure from here. Harper's Ferry, Nov. 22d, 1859—1.23 P. M.